​Before there was Woking Gymnastics Club, there was Pyrford Gymnastics Club, started in 1967 by Sue Gordon (who later became the first chairman of the new Woking Gymnastics Club) for local children. They trained in Pyrford Village Hall but quickly outgrew these premises and moved to Arbor Youth Club, then Horsell Sports Hall and finally to Monument School. All these sites were unsatisfactory and so Pyrford joined up with another club, Connaught Gymnastics Club, located in inferior facilities in Lightwater, to try to find a new, more permanent facility. Together, they started looking for a new site in 1977. In 1979 they took over the lease of part of Kinton Community Home (now the Mayford Centre) and converted it for use as a gym. 150 gymnasts trained there. Whilst at Kinton, the Club was opened up to boys as until then it had been for girls only (Simon Elliott our current Head coach trained there!) Although this site was better than previous venues, it was deteriorating badly. New accommodation was desperately needed. After many years of campaigning and fundraising, money was finally in place to go ahead with a much needed new venue. The money was raised through a combination of fundraising and grants from Woking Borough Council and the National Sports Council. The current site was found and leased from Woking Football Club. Our building started life at Gatwick Airport and was purchased second hand from the airport itself. 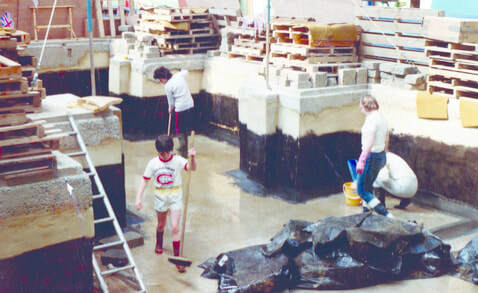 The total cost of the shell and the base, including the pit was £90,000. However, there was not enough money left to install heating – that was provided by yet more fundraising before the first winter. ​The name Woking Gymnastics Club was born in 1984 and the club actually opened in 1985 with 120 members, both squad and recreational and one full time salaried coach. Mike Steele (who still coaches at the gym today), the men’s regional coach at the time, was headhunted to join the club in the new facility to train the boys, as the club now had boys apparatus. As the gym was not used during the day, Kindergym was started (and later copied by many other clubs) and numbers increased dramatically. Within two years the club had over 1,000 members and had to employ an administrator. At this time Woking was a state of the art facility – one of only three or four full-time, dedicated facilities in the country. It was regularly used as a training venue by international teams when competing in the UK. Ross Brewer was a three times British Champion in Men's Artistic Gymnastics. He won two gold medals at the 1998 Commonwealth Games in Kuala Lumpur and the 2002 Manchester Commonwealth Games. In Women's Artistic Gymnastics, Kelly Hackman, competed for Great Britain at the 2000 Olympics in Sydney. Kelly and her parents Ralph and Tricia decided to move house from Watford to Woking to be "nearer to the better facilities of the Woking Gymnastics Club". Soon we were bursting at the seams and looking to move yet again! In 1997 the club was in talks with Woking Borough Council to move to a purpose built facility adjacent to the Leisure Centre, but this proved to be unfeasible as the land was prone to flooding. A few years later there was a plan to move to a facility at Bishop David Brown School but this also fell through due to planning issues. So…..on our current site we remain. We have grown hugely since the early days and still provide high quality coaching to over 1,200 members every week. We offer pre-school, recreational and squad gymnastics to both boys and girls of all ages and abilities through to adult gymnastics! We have a thriving boys squad who attain success at the highest level. We have had many gymnasts who have competed internationally, including Grant Gardiner who has competed for Wales in the 2010 Commonwealth Games. More recently, Jamie Lewis has been crowed Junior British all around Champion in 2015, 2016 and 2017 and continues to grow his international success also being crowned the 2017 European Youth Olympic Champion.